Would You Like Your Very Own Robot?! Home Oxygen Therapy is a medical treatment for patients suffering from chronic lung diseases. It involves the use of an oxygen concentrator to deliver oxygen via a nasal cannula or face mask to the patient and some may require being tethered to the machine on a constant basis. COPD is an umbrella term for these conditions and patients have restricted airflow through the lungs and experience coughing, wheezing and shortness of breath. The effect on quality of life can be significant and some are unable to participate in physical activities and require help to move. Home oxygen therapy aims to improve the patient’s freedom, health and quality of life by allowing treatment at home. Patients are encouraged to try and maintain a certain level of activity as research has shown that if exercise and mobility are retained then lung capacity and respiration improves. However some patients find this difficult as they are tethered to a pressurized oxygen container via tubing and the weight, which is typically 4kg, can make transporting and lifting awkward especially for the more elderly patients. Some patients use a small hand cart to transport their equipment around or use a portable unit which they can carry over their shoulder. Despite the huge benefits of H.O.T it still imposes restrictions on the user’s movements, mobility, ability to participate in certain activities and quality of life. A Follower Robot has been devised to help improve these patient’s lives. 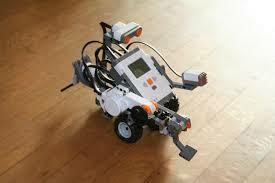 The robot can carry the equipment thereby reducing the physical burden and increasing freedom of movement. It is capable of following the patient’s movements and can follow behind the patient. It is simple to use, low weight, compact and at a low cost. They have started testing these robots on H.O.T users to see if they are indeed beneficial and can aid them in their daily activities efficiently. Most users have found the robot easy to use and to manoeuvre with. It is hoped that after more trials are completed it can be manufactured and sold commercially for COPD patients. These robots could drastically improve patient’s lives allowing them to easily move around and enjoy more out of life which could have a positive effect on their health also. More importantly, how amazing would it be to have your own robot? !